Watching “Island Girl” (a female Peregrine Falcon tagged by FRG in 2009) migrate northward for the 5th consecutive year, it's difficult not to be charmed by her. By combining efforts across research teams, she and other PTT- or otherwise-tagged birds have disclosed a few more of the nifty migratory tricks used by peregrines flying to and from the breeding grounds. Small samples have a nasty way of revealing enough information to get folks all hot and bothered, and subsequently flustered when seemingly clear patterns turn out to be no more than mere coincidence when viewed in the context of larger samples. But just for fun, Mark Prostor (who is a big part of the Arctic Raptors research crew) compared the relative positions of “Island Girl” and “64493” (a PTT-tagged peregrine in 2011 by Arctic Raptors) as they make a final push for their respective breeding territories on Baffin Island and the Melville Peninsular (near Igloolik, Nunavut). 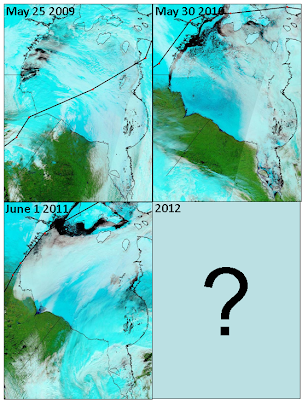 PTT data showed that both birds paused this last week, and despite being more than 700km apart, when viewed in the context of MODIS near-real-time satellite imagery, their stop locations coincided with the snow-line which tends southward nearer to the Hudson Bay and James Bay. Taking the stop location of each bird relative to their known destinations revealed additional similarities; both birds positioned themselves at the snowline about 1300km direct line of flight to their breeding sites at remarkably similar compass headings (about 50 degrees). Stop-locations of "Island Girl" (red) and "64494" (blue) at the snow line (white arc). Note the parallel compass headings (about 50 degrees) from their relative stop-locations at the snow line; at the time (May 31) both birds had about 1300km to reach their respective nesting location; both birds took a northwest heading near the US/Canada border before resuming their flight to the northeast. Earlier flight paths showed another similarity; both birds veered northwest near the US/Canada border rather than simply maintaining a northeast heading which would have taken them on a much more direct route towards their breeding locations. 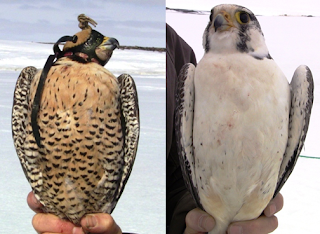 Incidentally, both birds will also arrive much later than other tundra peregrines. 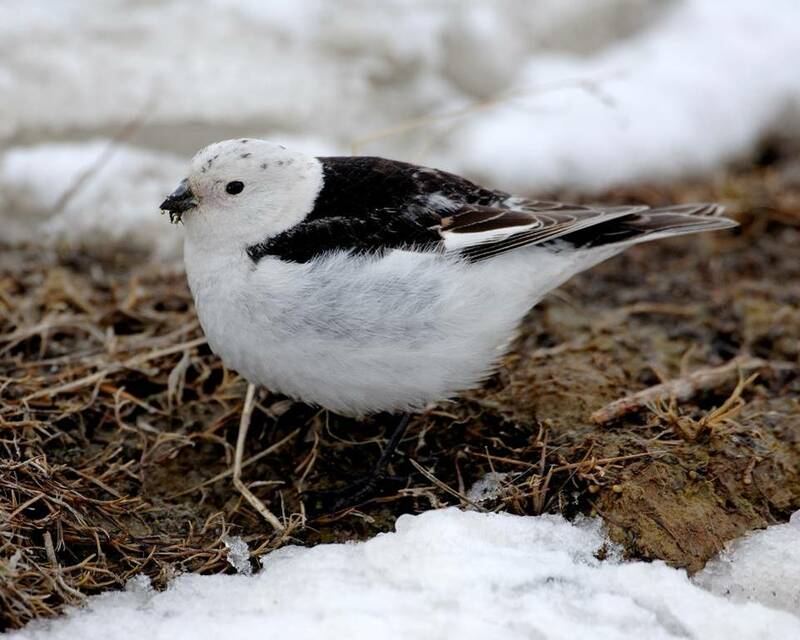 Despite extensive snow cover, our spring survey at Rankin Inlet showed that most breeding sites were occupied by pairs by May 22, and tracking by light-based geolocators (which weigh 1 gram) showed that arrival of some birds at Rankin Inlet was as early as May 20. Breeding latitude likely plays a part (both “Island Girl” and “64493” have further to go than birds breeding at Rankin Inlet) in the explaining the difference. 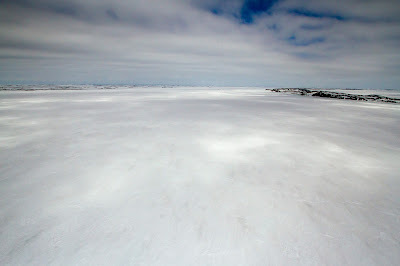 However, our field crews trapped birds on territory near Igloolik on May 28th. While it could be coincidence that both PTT-wearing birds will arrive late, just maybe it’s not. "You ain't in Kansas, neither"
On August 19 2010, a 36 day old male Peregrine Falcon that had previously been marked with a colored leg band (25 A) was seen flying from its natal site. 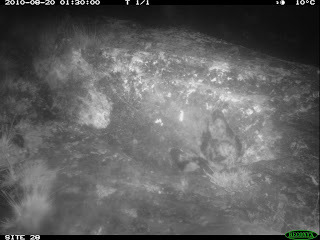 It was later "camera trapped" at a neighboring nest site that contained 2 other nestlings (27 A and 73 E). 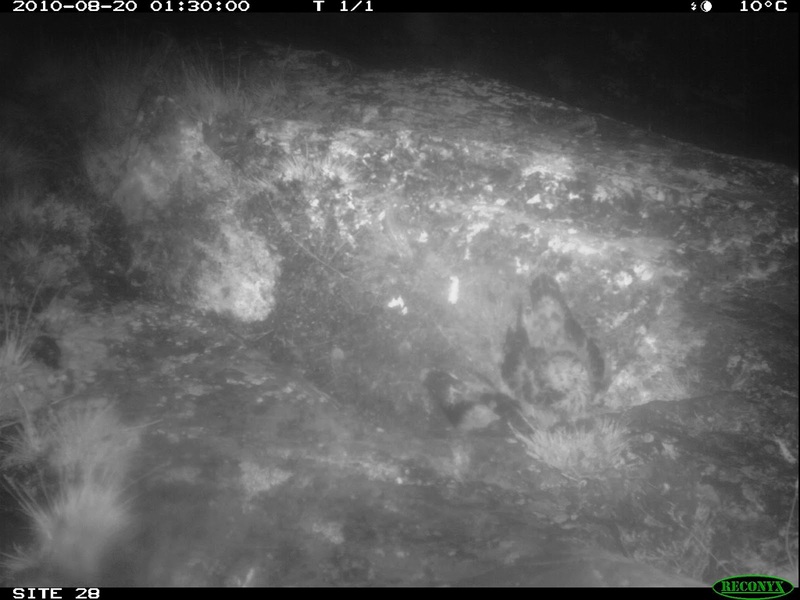 Motion sensitive camera images showed that the adopted nestling remained at the neighboring site for several days during which time it shared the nest ledge with the two resident nestlings and was fed by the adults that occupied the site. The juvenile falcon then returned to its natal site where it again shared the nest ledge with its natural sibling and received care from its natural parents. 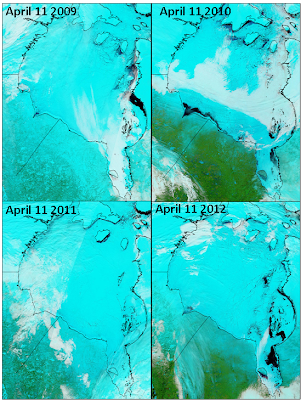 A full decription of the observation has been accepted for publication and will appear in the June 2013 issue of Arctic, the following images complement the note. Images are generally only a few seconds apart, but check the top left corner of each image for time-stamps. Temperature is recorded in the top right corner and site number in lower left (Click on images for larger versions). 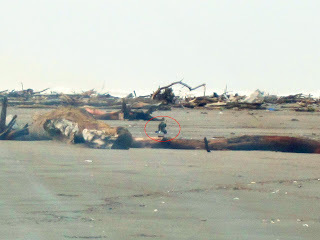 25 A at adopted site with 27 A and 73 E within 3 hours of leaving his natal site on August 19. 27 A and 73 E spent several hours alone on the nest ledge; then when the adult female returned to the nest approximately five hours later with another prey item, 25 A quickly returned to the ledge. 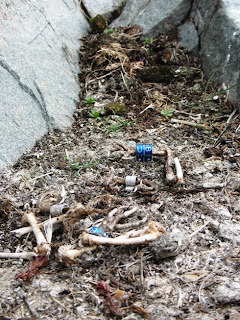 On August 20 and August 21, the adult female resident at Site 28 delivered prey items on 4 more occasions. Each time 25 A was present on the nest ledge with the resident nestlings and competed for a share of the prey item that was delivered. 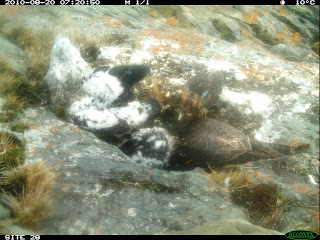 An adult and the adopted nestling were observed together on the nest ledge at Site 28 on August 23, more than 3 days after flying from its natal site (Site 29). At Site 29 on August 24 in the morning, an adult falcon delivered a prey item to 62 E (the natural sibling of 25 A); within a few seconds 25 A appeared on the ledge at Site 29 with 62 E after spending nearly five full days away from the site. The following day, the resident adults at Site 29 made several prey deliveries which were mostly consumed and cached by 62 E. However, photographs of 25 A indicated that the male was on the nest ledge at least twice that day, and clearly showed that 25 A either consumed or shared prey items that had been previously cached by 62 E. What?? F.p. anatundrium and F.p. tundriassini?? Of course there's no such thing as F.p. anatundrium or F.p. tundriassini, but for a little fun and to emphasize variation in plumage within sub-species even at small scales, I thought I'd post some images of 2 birds that were trapped one after the other at our study area in Rankin Inlet this spring, and assign an "invented" sub-specific name to them based on appearance and breeding range. 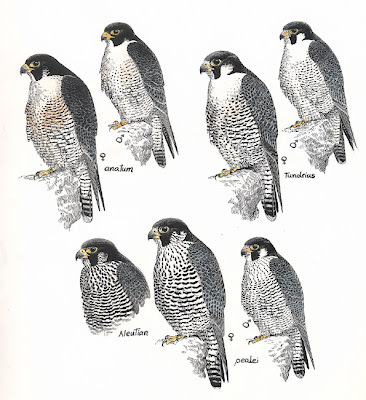 But first, a little context and an ever-so-brief introduction to the three sub-species of Peregrine Falcon that are recognized in North America...F.p anatum breeds south of the treeline throughout much of continental North America; F.p. pealei breeds in the Pacific Northwest from Puget Sound northward to Aleutian Islands in the Gulf of Alaska; and F.p. tundrius breeds in the North American Arctic and Greenland. All have been studied sufficiently to generally distinguish one sub-species from the other at the population level. A fourth sub-species (F.p. cassini) is a South American resident with variation in plumage that is known to include a color phase referred to as the Pallid Falcon. F.p. 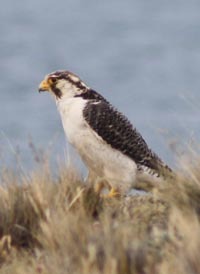 cassini is usually cited as the only subspecies of peregrine falcon worldwide that presents a white or pallid color morph. Our study area at Rankin Inlet on the western shores of the Hudson Bay in Canadian sub-Arctic is 500km north of the tree-line, and the peregrines that breed there are obviously well within the range of tundrius. Notwithstanding the work that has been done to describe tundra peregrines, variation in plumage is so wide that assigning individuals according to the general rules that describe the sub-species in general is often difficult to do. The two females in question expressed plumage characteristics so unlike that described for tundrius that if they had been caught during migration or on the wintering grounds would almost certainly not be to assigned to tundrius...thus our tongue-in-cheek "discovery" of two new sub-species that we named F.p. anatundrium and F.p. tundriassini. 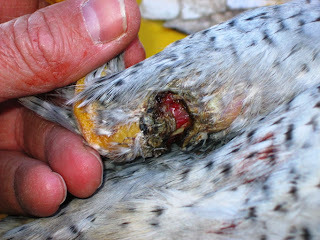 The next female trapped was well marked with a salmon colored breast normally associated with F.p.anatum. Although we were unable to compare the 2 females in the field, the images of each one when placed side by side nicely illustrate plumage variation, and underline just how difficult it can be to assign any given individual to is true sub-specific origin. 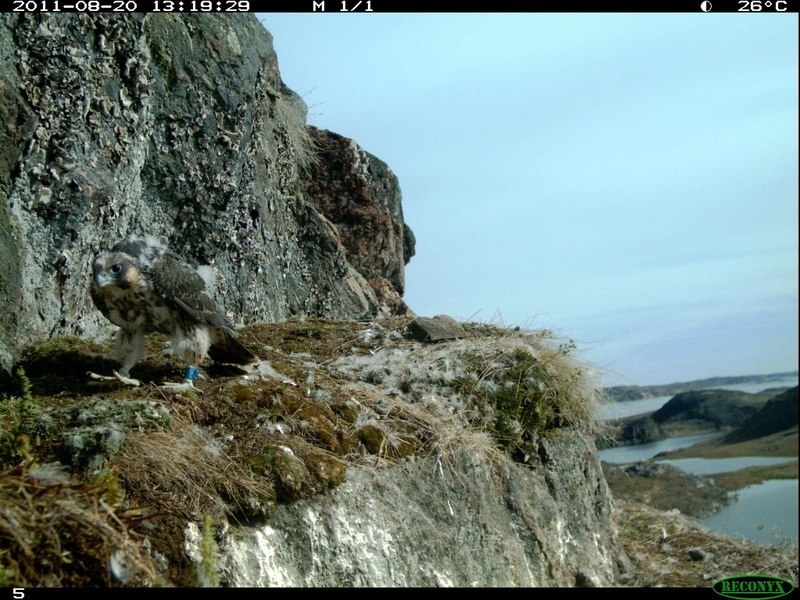 For arctic nesting Peregrine Falcons we know that late arrival at a breeding site does not entirely preclude a successful breeding season, but a shortened season stacks the odds against those that do arrive later. Early arrival lengthens the season and may ensure easy access to a breeding territory, but the trade-off can be low food supplies. Apart from resident lemmings (when present) and early season ground squirrels, Snow Buntings are often the only migrants species present when the falcons first arrive. Under ideal conditions arrival would coincide with no competition for breeding sites, mild weather and plentiful food. To a degree, arrival depends on date of departure from wintering areas, which is prompted by, amongst other factors, day length. Judgement with regard to when to leave can be very precise even over several years for some Calendar Birds. 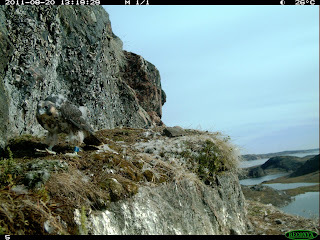 A falcon known as Island Girl (see Falcon Research Group Blog) that winters in Chile and spends her summers on Baffin Island, Nunavut began her inward migration April 14, 2012. Her departure date in each of the 4 migration years that she has been tracked has varied only slightly (12/04/2009, 13/04/2010 and 11/04/2011). 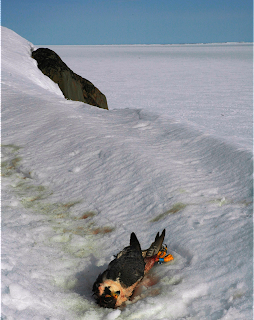 With no way to judge what can be highly variable environmental conditions thousands of miles to the north, tundra peregrines simply keep going until they encounter circumstances that preclude further travel. By late May snow cover around the Hudson Bay has retreated 300 miles further northward, in some years reaching almost as far as the Manitoba border with Nunavut. Thousands of peregrines literally stream into the Arctic flying around or over the Hudson Bay at this time of year. Chance encounters in the vast Canadian Arctic are extraordinary. 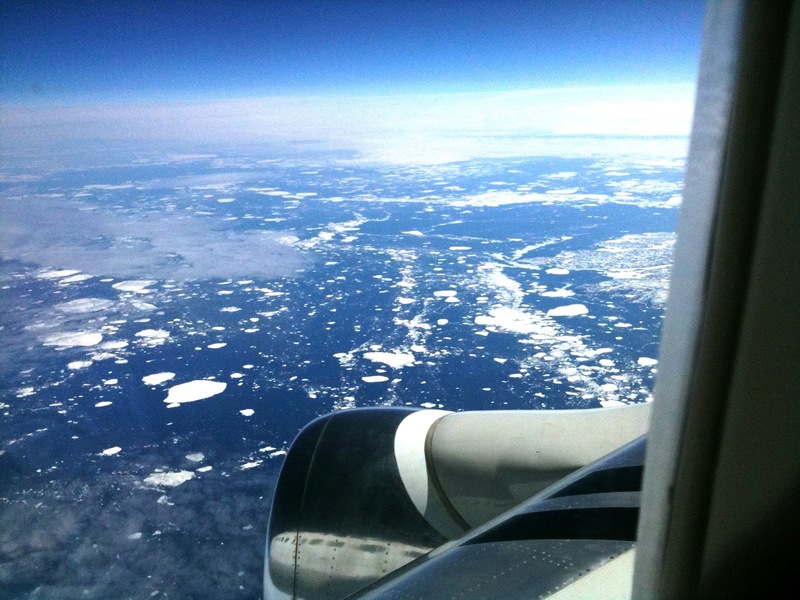 To get to our Baffin Island study site at Steensby Inlet our field crews usually usually fly from Rankin Inlet to Iqaluit, a route that overflies South Hampton Island and the Hudson Strait...a flight path remarkably similar to that taken by Island Girl in 2010. 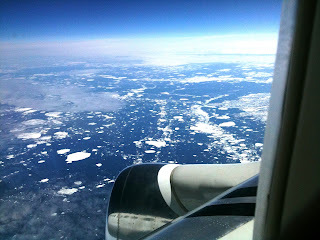 By 2010, we were already well aware of Island Girl's breeding location on south Baffin Island, and en route to Iqaluit, Mark Prostor snapped a shot of the Hudson Strait a little to the east of Salisbury Island and south of her breeding location on June 2. You can follow daily location updates and the FRG crew as they literally chase "Island Girl" and "Felipe" (a satellite tagged male tundra peregrine) north from Chile. 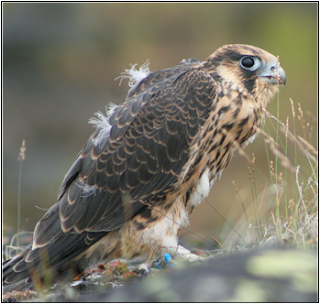 For many bird species clutch size increases with latitude, yet throughout their range peregrines (migrants and residents alike) normally lay 4 eggs. Those that breed at relatively southern latitudes have the luxury of time (more than 200 days) and very mild breeding conditions, even to the point that a breeding season can be salvaged by laying a second clutch of eggs if the first is lost. 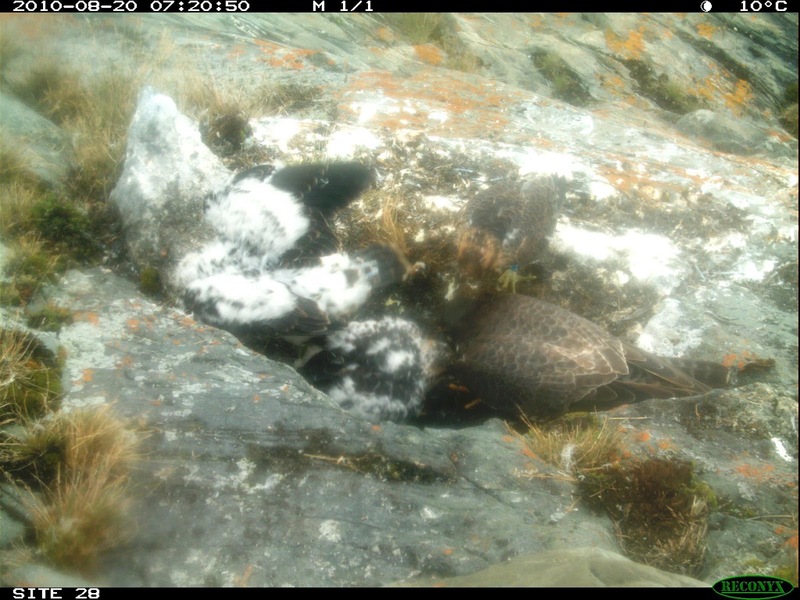 Not so for Arctic-nesting peregrines attempting to raise a brood to independence. The window of opportunity slams shut in a measly 120 days or so, and it's a one shot deal. From the perspective of a Hatch Year bird, the schedule is tight. 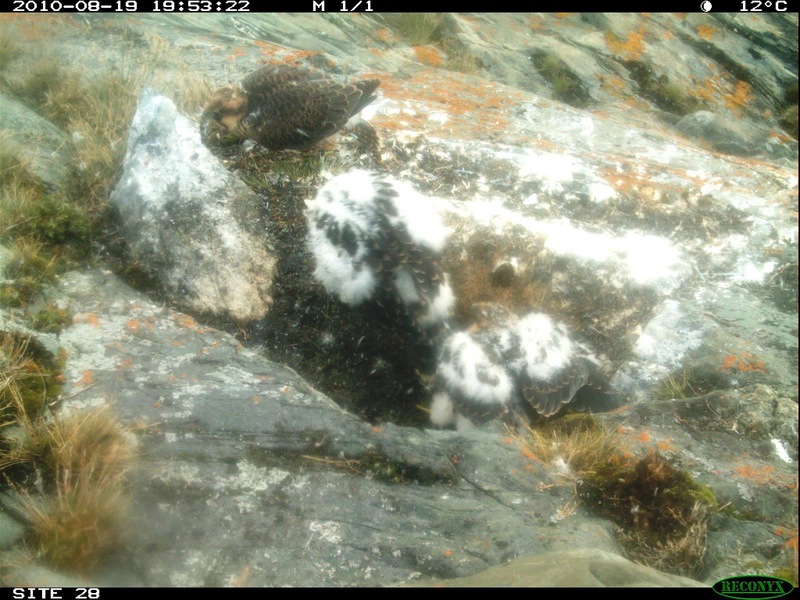 Research conducted by Alex Anctil shows a nestling with the best chances of survival will come from the first or second laid egg in an early laid clutch. Almost 3/4 of a nestling's "life" is taken up by incubation (~34 days) and growing time on the nest ledge (~40 days), leaving only 28 days to figure out how to fly and catch at least some prey before their first unknown outward migration begins. For tundra peregrines, the relative ease (presumably) of wintering is close to over...departure for breeding cliffs is only a fortnight away. Although early arrival at a breeding cliff can be risky, it has its benefits too...there's usually no objection from other potential breeders, at least for a while. Eventually though there's conflict at some level. Most often disputes are short, vocal and without contact. On occasion though a brouhaha ends in injury or worse. Life time reproductive success is real currency here, and where adult investment (see weight loss) in offspring is within reason, eggs and young are closely guarded day and night. The margins are narrow and the investment considerable. All things being equal, adults arrive in late May, lay a full clutch of eggs by the middle of June, hatch their young in mid-July. Rearing a brood of nestlings lasts 'til the last week of August, and fledglings remain near the cliff for another 3 weeks. Birds leave for their wintering territories in the middle of September. 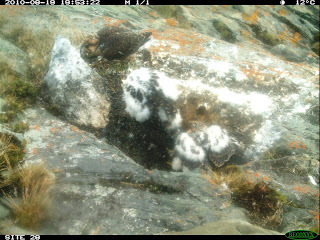 August 20, 53 C at 35 days old on her nest ledge near Iglulik, NU. Barry Robinson banded 53 C (and her 3 siblings) at 27 days of age on August 12, 2011. She weighed 792g. Three months later (November 11), she was recaptured in Mexico by Oscar Diaz. She weighed 920g. Once in hand, Oscar (a falconer and bander) realized that 53 C had frounce (Trichomoniasis), likely as a result of consuming an infected pigeon or dove. The infection had advanced sufficiently to cause watering and swelling of her eye, and although necrotic lesions were apparent in her mouth, they were still quite small. Oscar treated the infection, and a month later began flying and hunting with 53 C. She hunts at 940g, and will be released in April in time to migrate. It's not often you see a blue banded falconry bird, good to know she is in good hands.